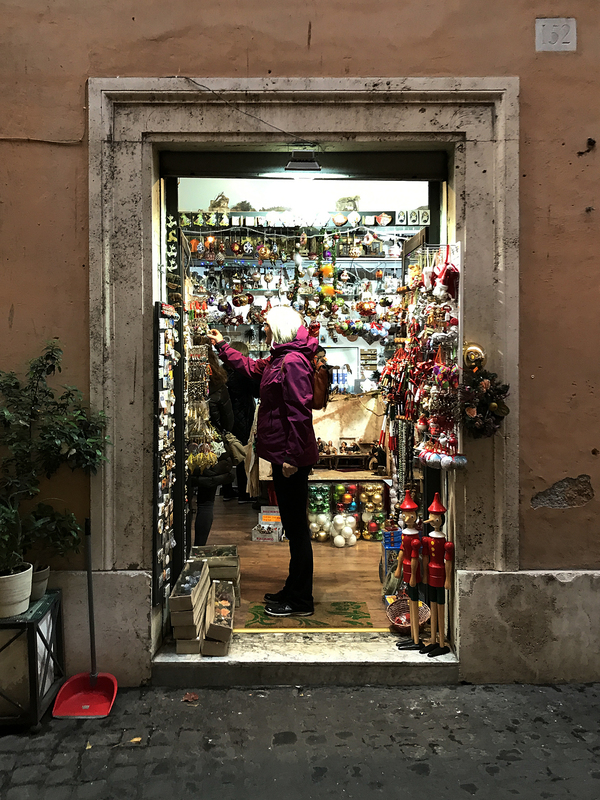 Spain, Italy and Greece, November 2017 | Brent Lynch, Artist. November 2017: Late autumn is a great time to go to Europe. 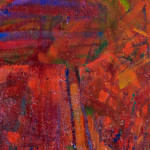 Nancy and I wanted to haunt art galleries, museums and historical sites so the fall means little or no line ups. It also means closer weather for touring. 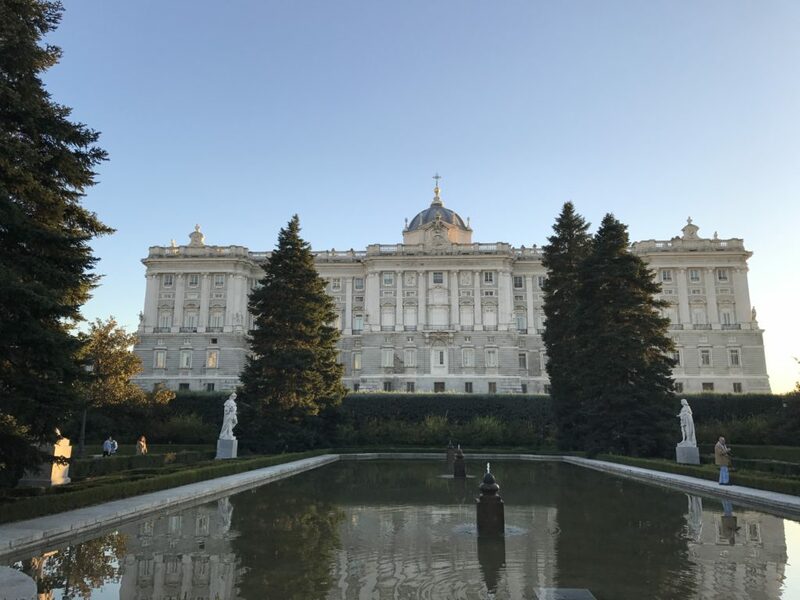 After a short stay in London we flew down to Madrid. 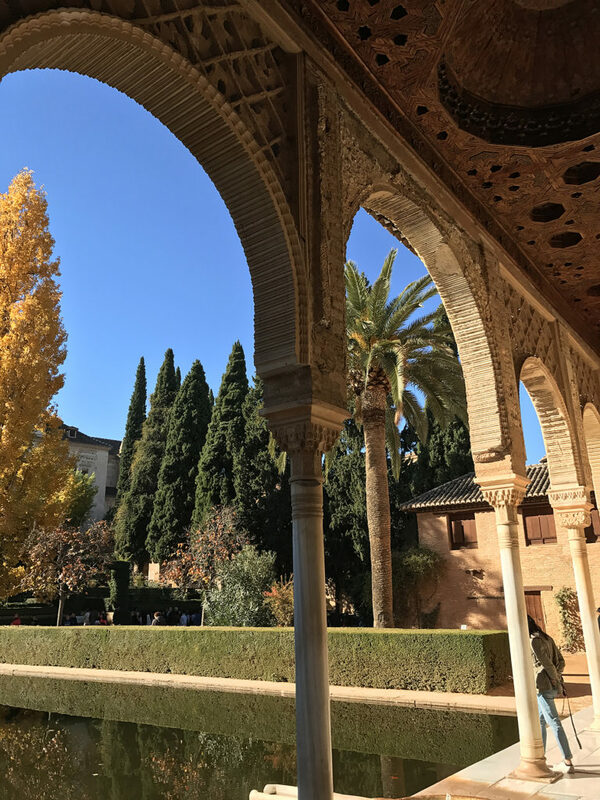 A few days in the stunning and beautiful ol’spanish capital did not disappoint, although, one of my all time favourite cities is Granada and we spent some time there. 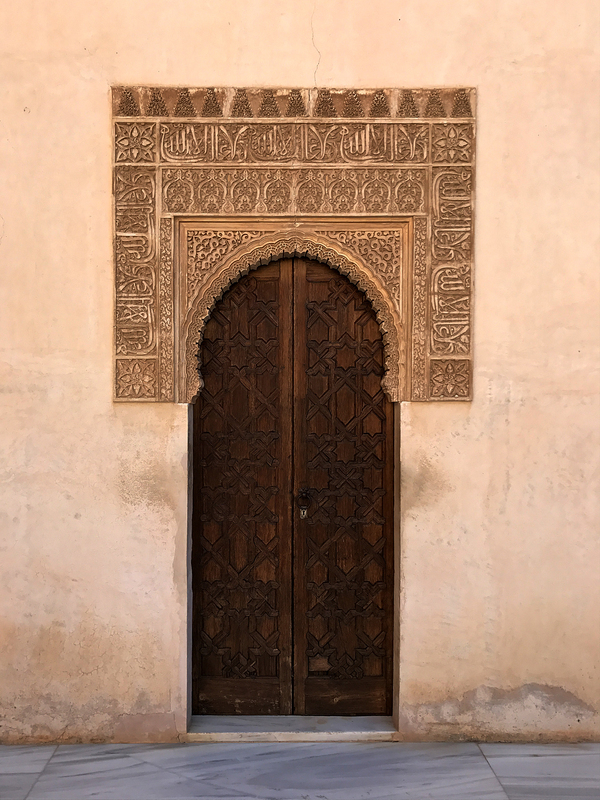 A Morrish stronghold until the 14th century is a renaissance of Arabian architecture and culture integrated into Spanish influence. There’s no other city like it. 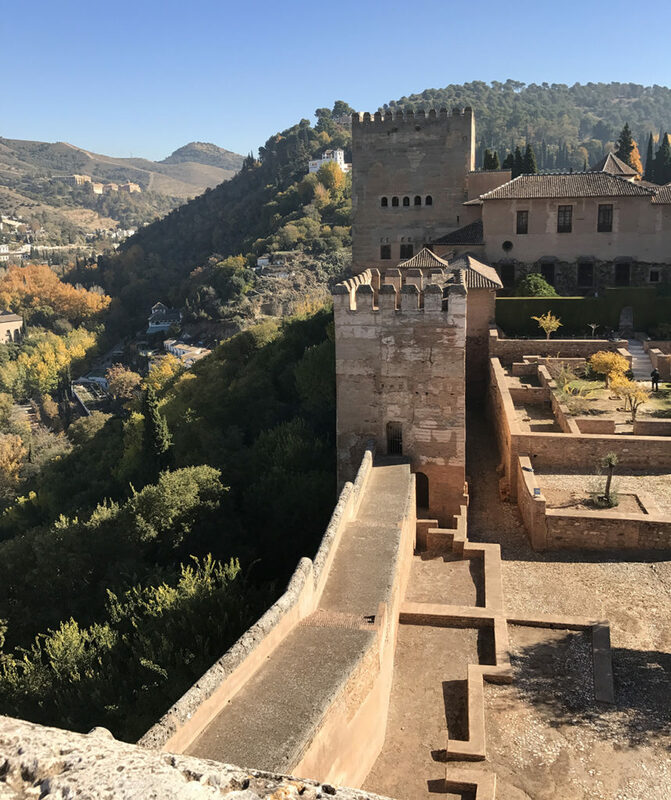 The ‘Alhambra’ ( 10th century Morrish palace and fortress ) is magnificent in the midst of Granada like the Acropolis is to Athens. The south west corner of Spain is wonderful! Cities such as Toledo, Seville and Malaga surround Granada. You could spend years there and not explore it all! Athens was on my bucket list but not anymore. 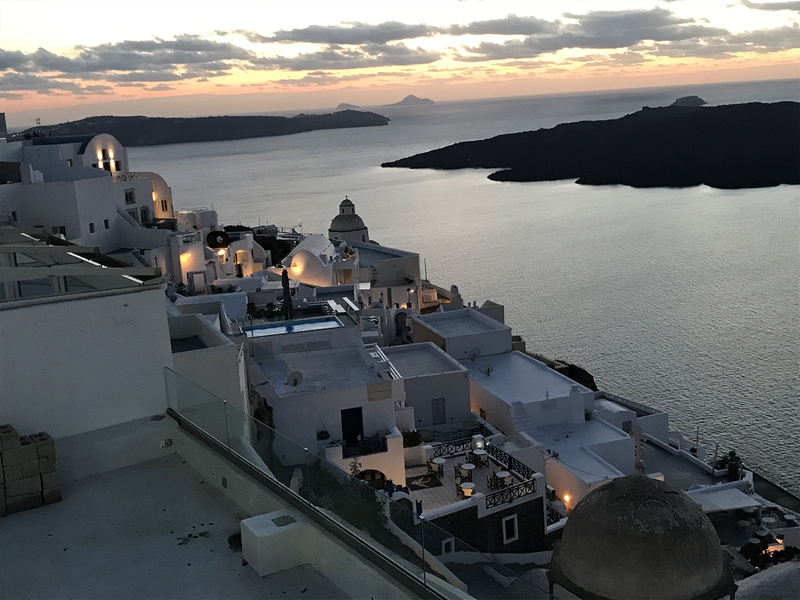 Greece is the one place that eluded me over the years. I love philosophy and history so you’d think I had gone long ago, but no! I guess the Gods made sure I was ready for it. Nancy had been there in her youth and wanted to visit again. 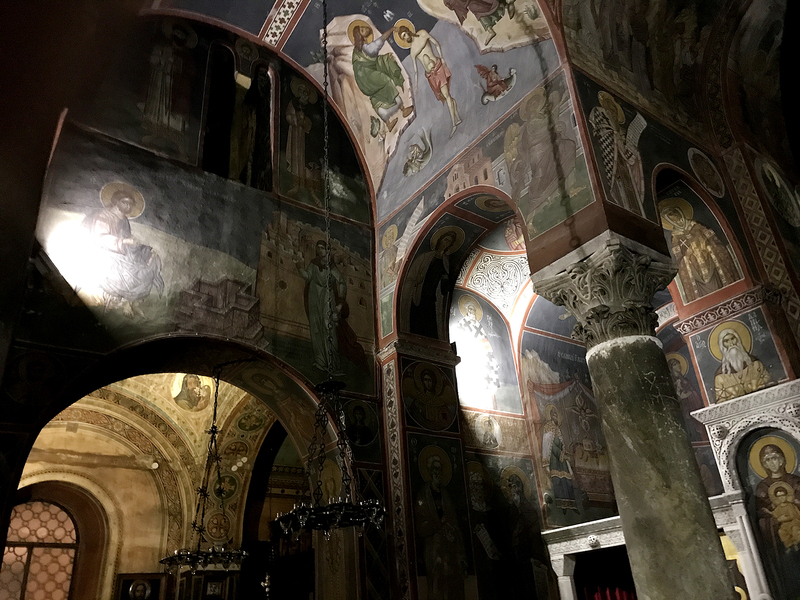 Greece is amazing if you love history…if you don’t care, don’t go. 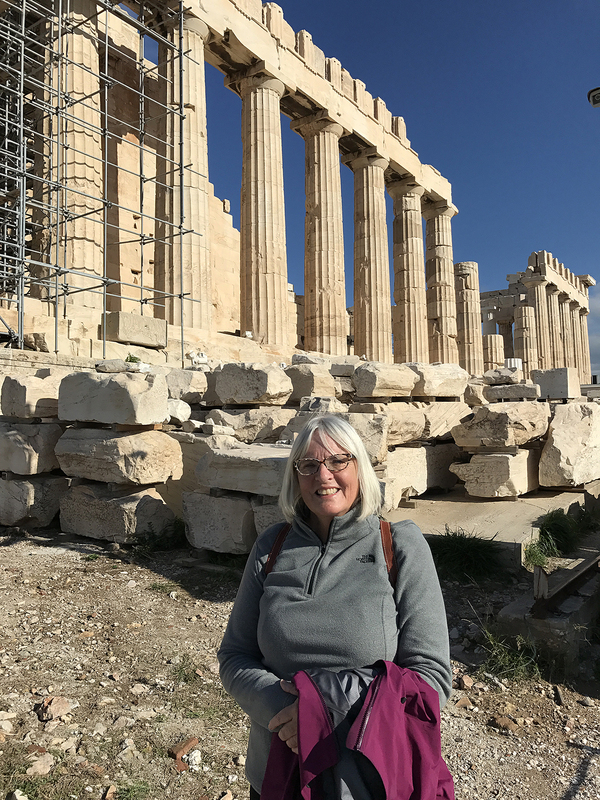 Athens itself is rough and possibly even dangerous but redeems itself at the sight of the Acropolis and surrounding area. I walked and rested where Socrates and Plato walked, lectured, argued their madness and rested. Entered the amphitheatres and temples where the western revolution of thinking began! How good does it get. 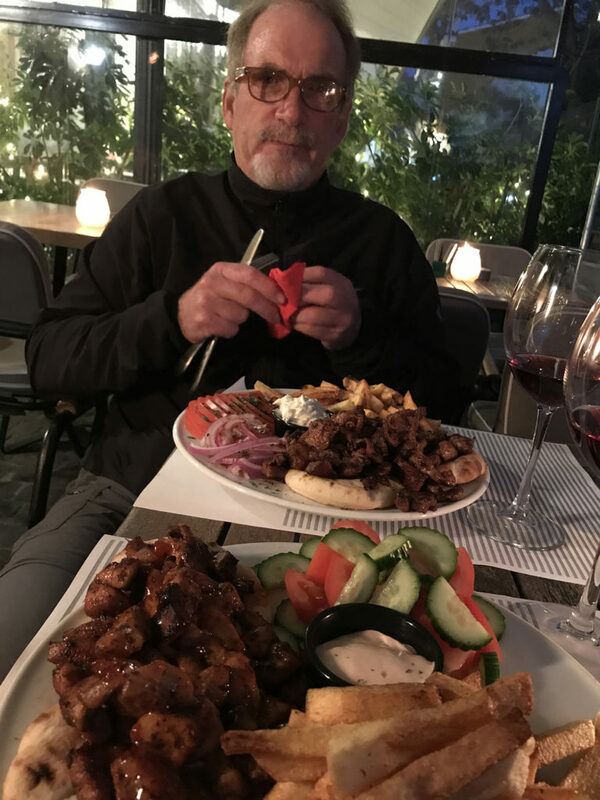 It was with mixed feelings we had our last meal and toast at a cool little terrace restaurant in Plaka just below the Acropolis. 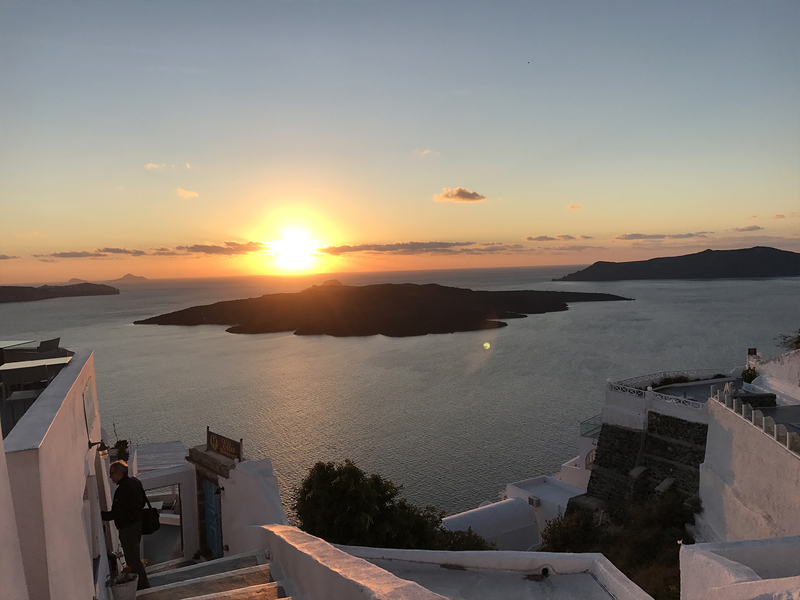 The next day we were off to the island of Santorini for our final week of rest and then home; all goes too quick. 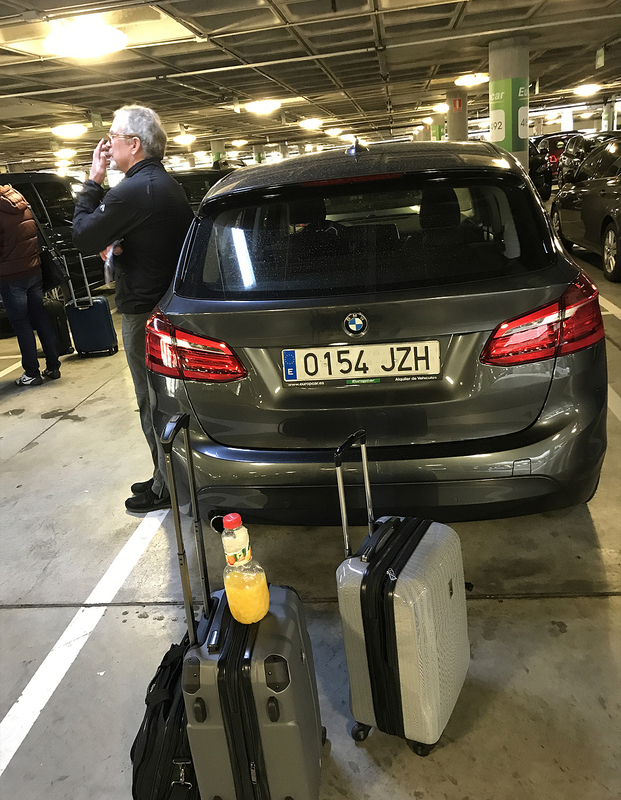 Arrived in Madrid airport, pick up wheels and off we go through Spain! 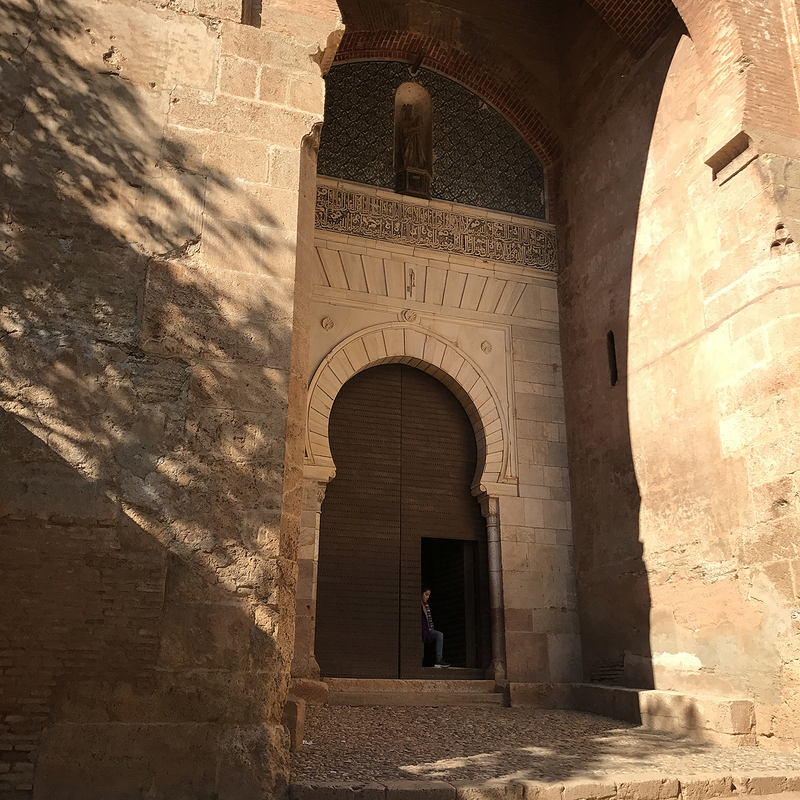 Granada, Gate to Alhambra, 8th century. Looking down from the main tower back toward the fortress grounds, palace beyond. Granada, the inner gardens of the Alhambra Palace. 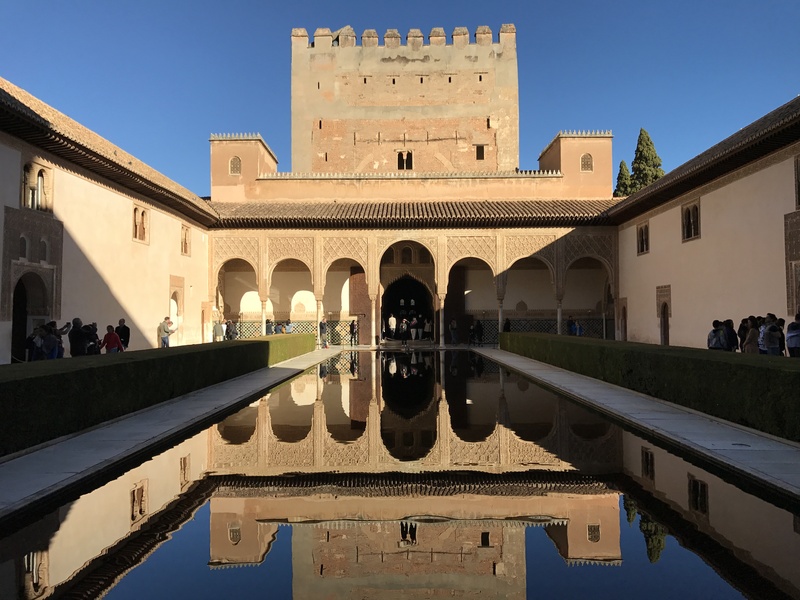 Granada, Inner courtyard of the Alhambra Palace. Classic Morrish door all over Granada. 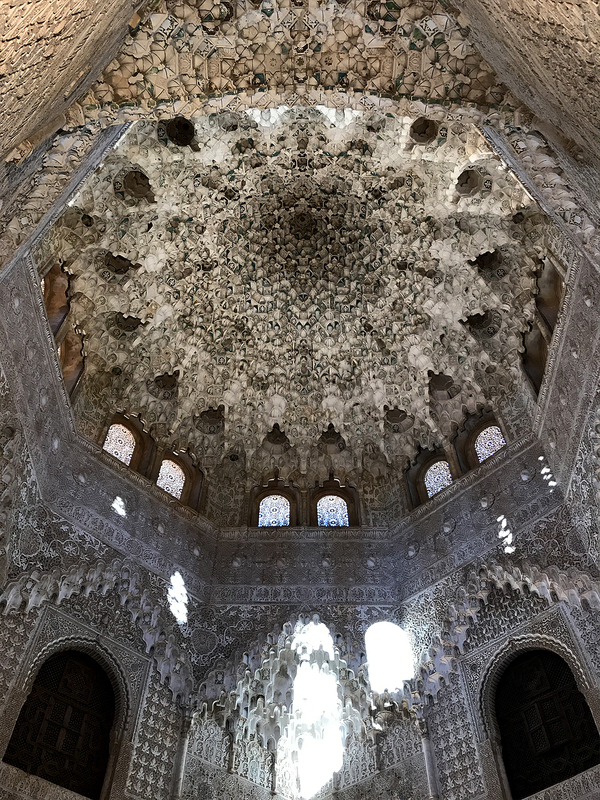 Granada, entrance hall of the Alhambra Palace. 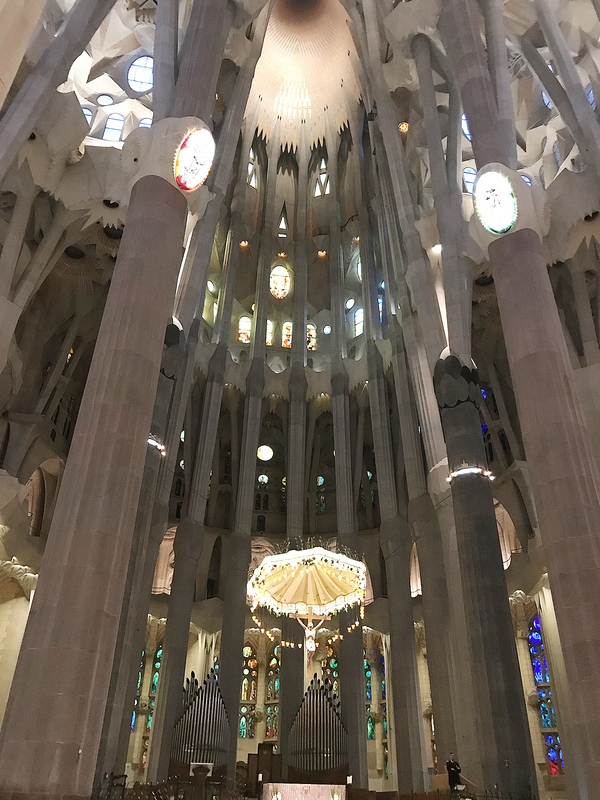 Barcelona, Antoni Gaudi, the great architect of the 19th and 20th century. 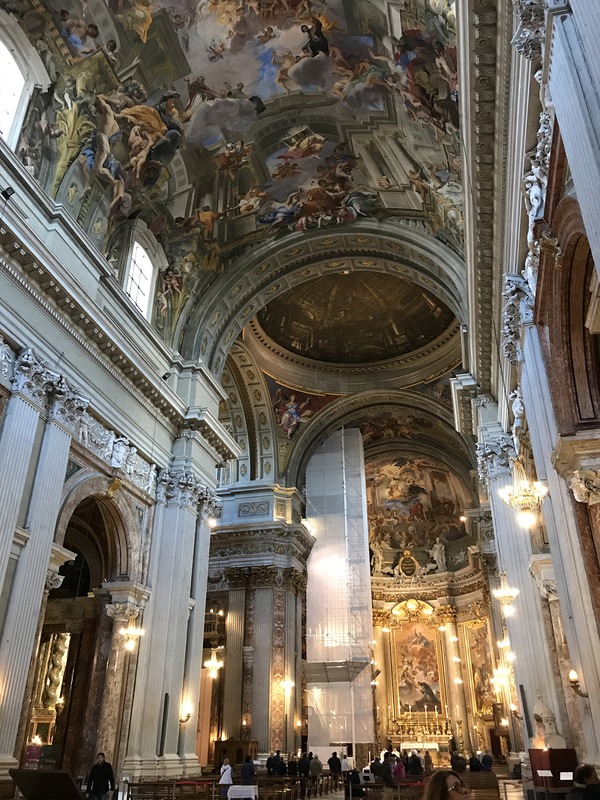 Interior of his Cathedral. Rome, Goddess by a statue of Diana. 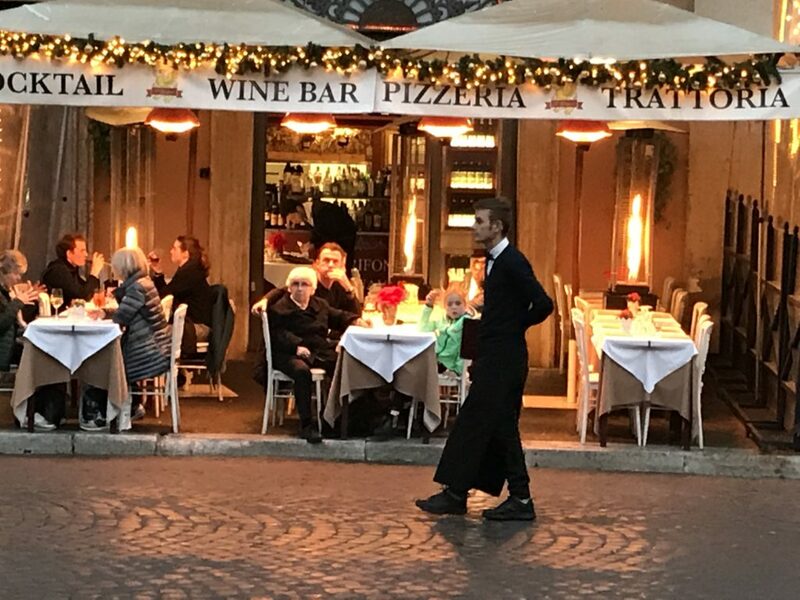 Rome, a classic terrace restaurant in the old quarter of Rome. 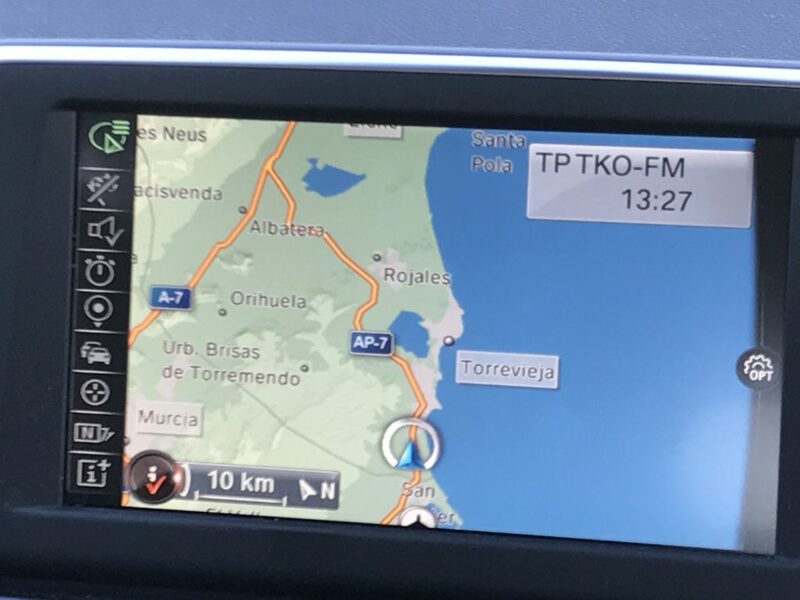 This GPS says we’re somewhere on the Spanish coast. 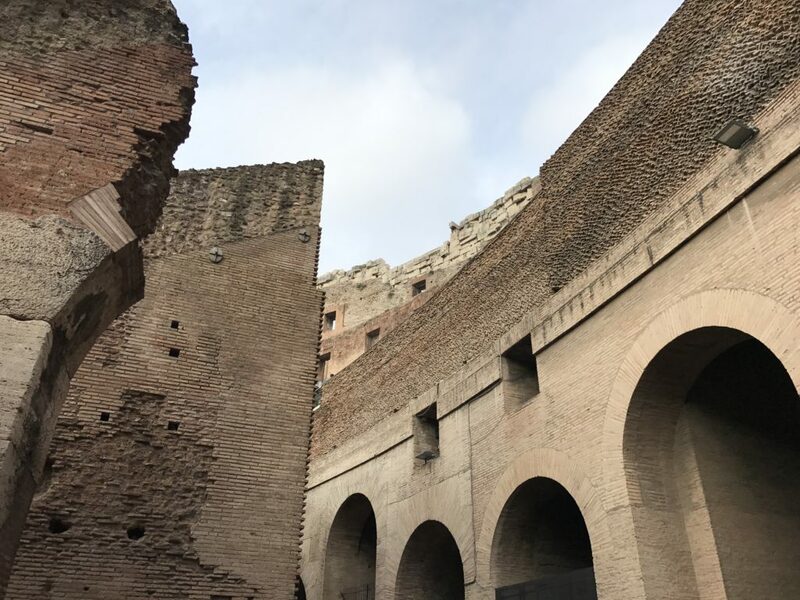 Rome, much restoration on the Coliseum since ’74 when I was last here. Wow! 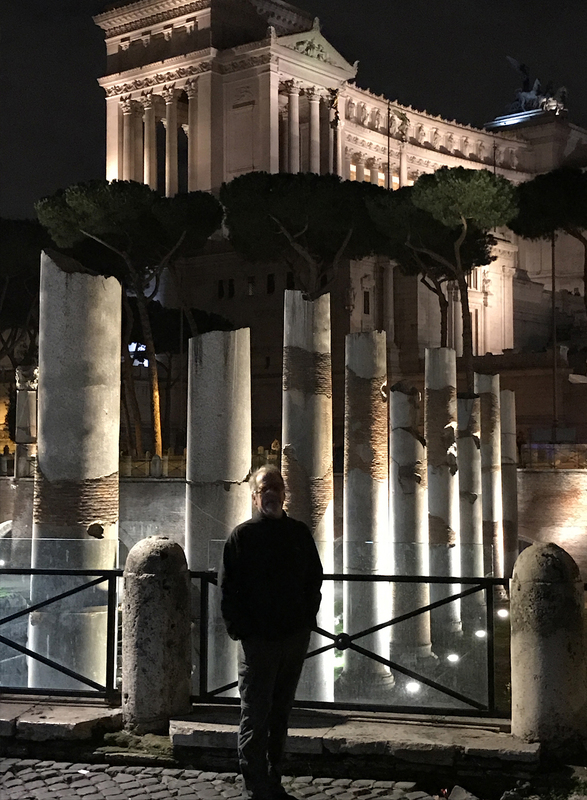 Rome, next to our hotel were the ancient ruins, Italy Heaven Monument behind. Rome, Vatican, one of my favourite sculptures ‘The Pieta’ covers the big themes! 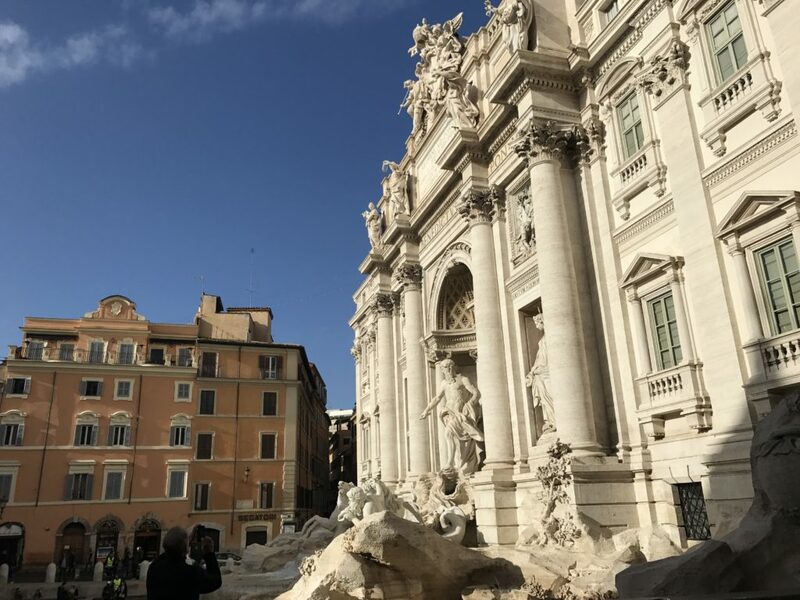 Rome, Trevi Fountain in the morning. Beautiful square! 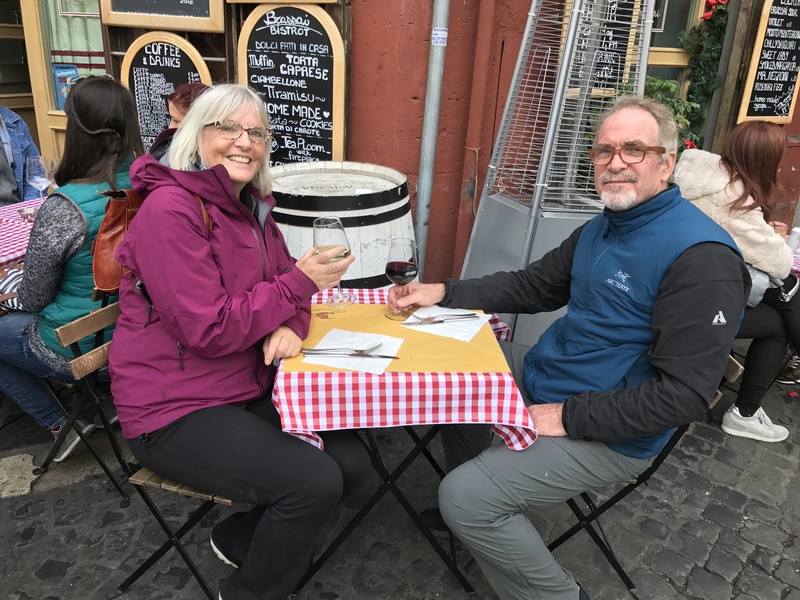 Rome, restaurant on the Piazza Navona…my favourite paizza or square in Rome. 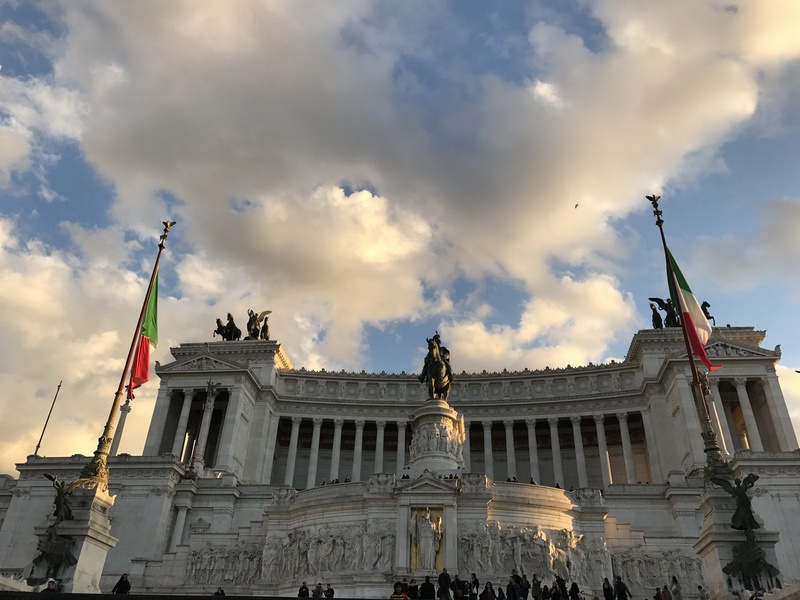 Rome, Piazza Venezia or Italy Heaven. 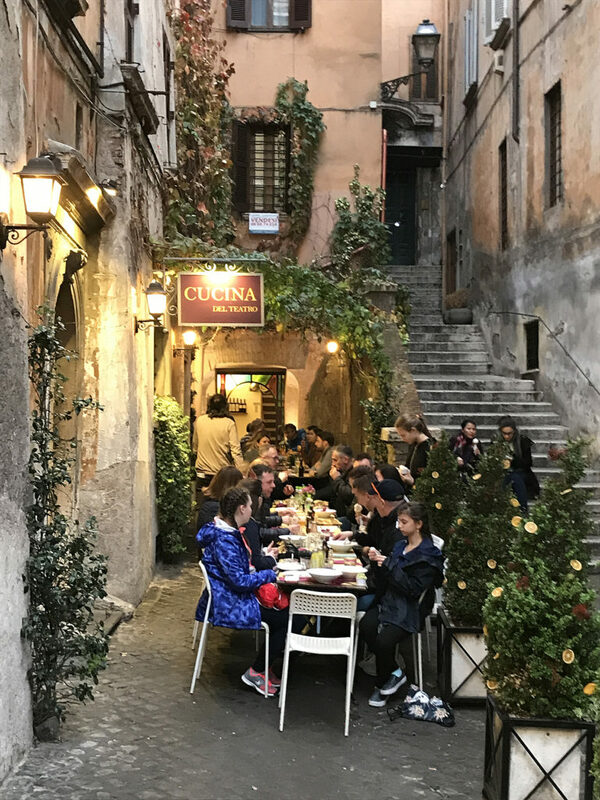 Rome, cool little restaurant off Spanish Steps. 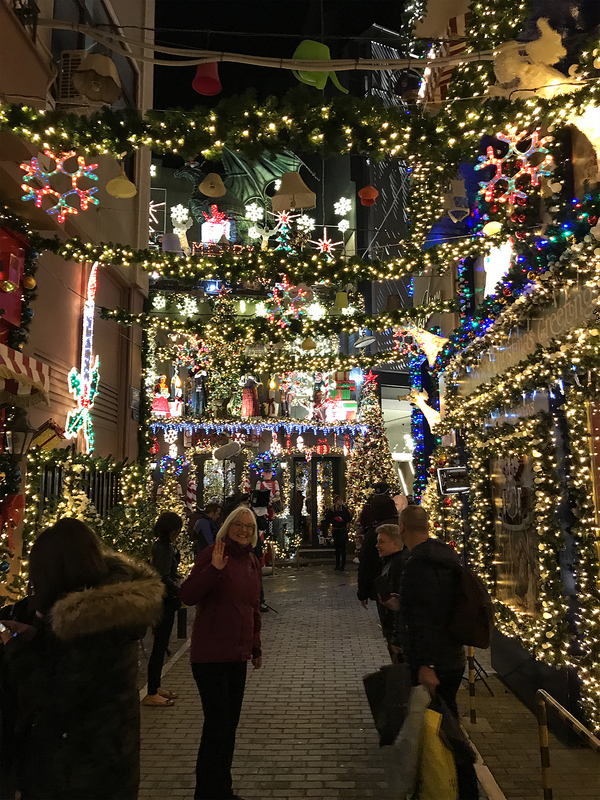 Christmas in Athens….who knew! Nancy in the midst. 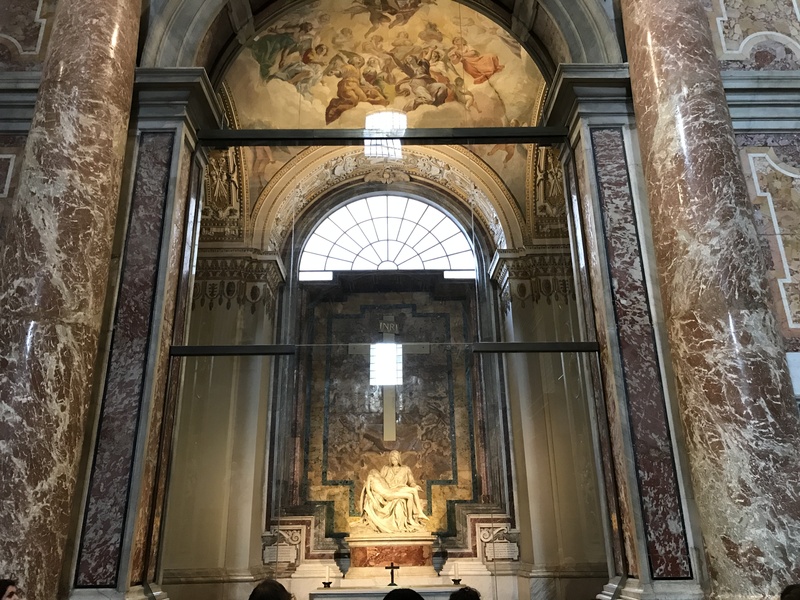 Rome, St. Peters Basilica, Vatican…hasn’t changed, still trying to crush the ego. Athens, they know how yo eat for heart attacks. 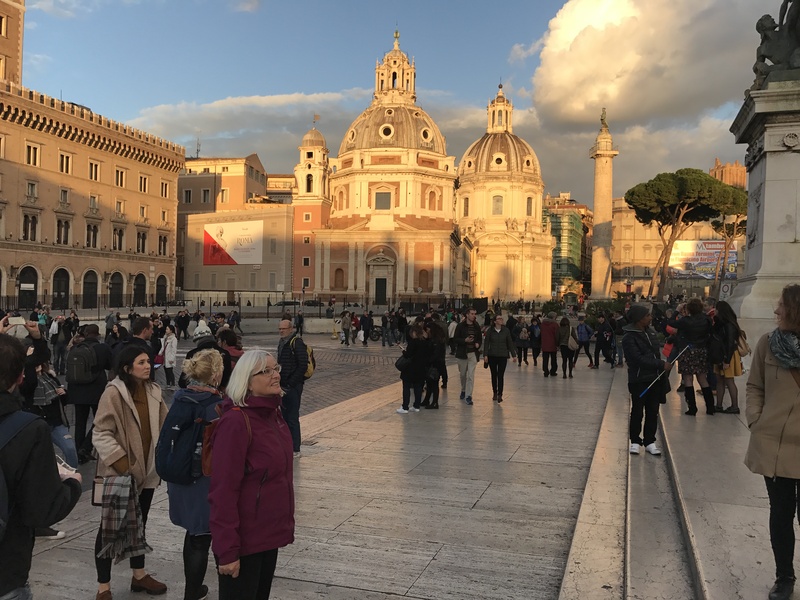 Rome, Piazza Colonna. 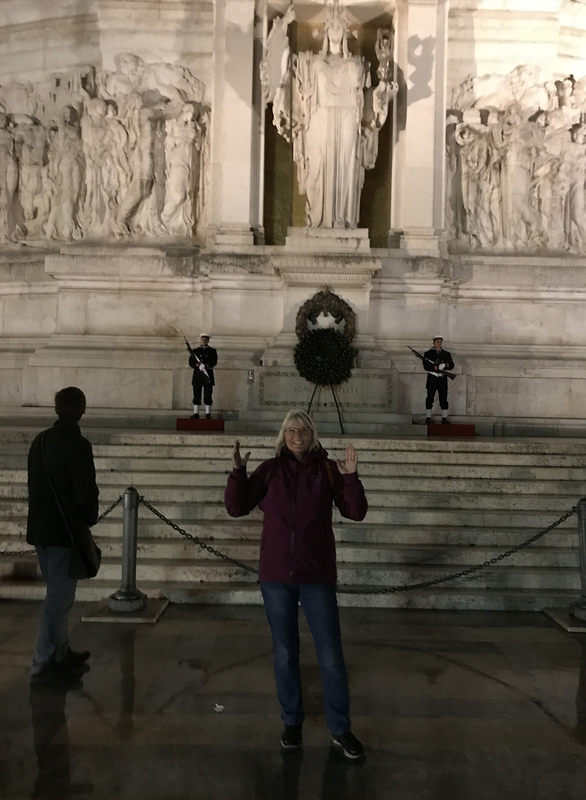 Nancy entering St. Ignazio Cathedral, my favourite Roman Cathedral. 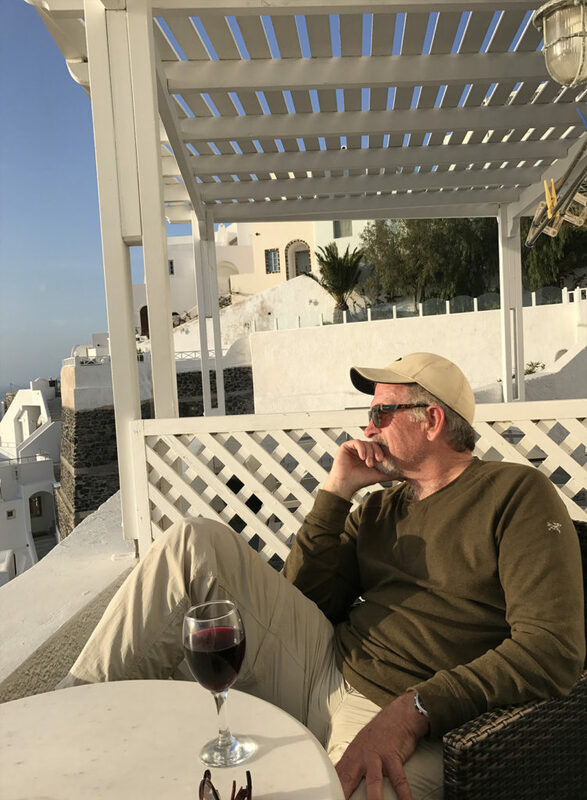 Santorini, Brent contemplating the world…red wine and a great view! 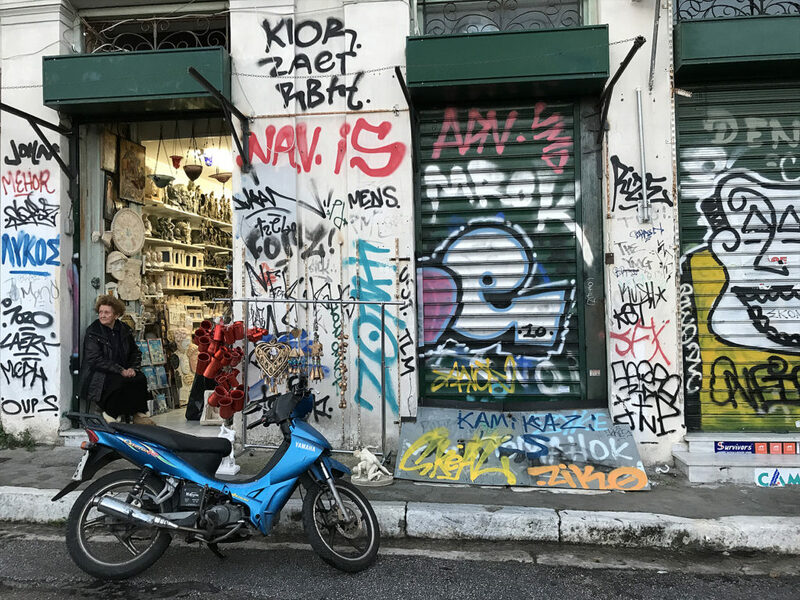 Athens, street art abundant! City could use a clean up. Santorini, town of Fera where we stayed….very wonderful and strange.